Astronomers have made the first unambiguous detection and image of an elusive type of object known as a brown dwarf. The evidence consists of an image from the 60-inch observatory on Mt. Palomar, a spectrum from the 200-inch Hale telescope on Mt. Palomar and a confirmatory image from NASA's Hubble Space Telescope. The collaborative effort involved astronomers at the California Institute of Technology, Pasadena, CA, and the Johns Hopkins University, Baltimore, MD. 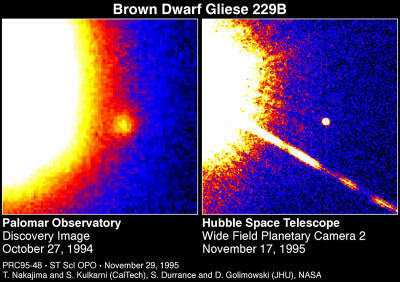 [right] - This image of the GL229B (center) was taken with Hubble Space Telescope's Wide Field Planetary Camera-2, infrared light, on November 17, 1995. The Hubble observations will be used to accurately measure the brown dwarf's distance from Earth, and yield preliminary data on its orbital period, which may eventually offer clues to the dwarf's origin. Though the star Gliese 229 is off the edge of the image, it is so bright it floods Hubble detector. The diagonal line is a diffraction spike produced by the telescope's optical system. The brown dwarf, called Gliese 229B (GL229B), is a small companion to the cool red star Gliese 229, located 19 light-years from Earth in the constellation Lepus. Estimated to be 20 to 50 times the mass of Jupiter, GL229B is too massive and hot to be classified as a planet as we know it, but too small and cool to shine like a star. At least 100,000 times dimmer than Earth's Sun, the brown dwarf is the faintest object ever seen orbiting another star. "This is the first time we have ever observed an object beyond our solar system which possesses a spectrum that is astonishingly just like that of a gas giant planet," said Shrinivas Kulkarni, a member of the team from Caltech. "it looks like Jupiter, but that's what you'd expect for a brown dwarf." 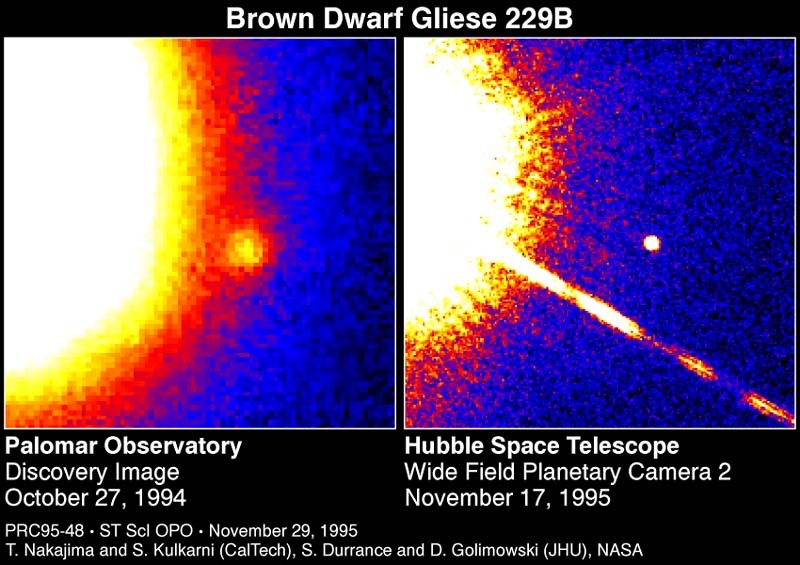 The infrared spectroscopic observations of GL229B, made with the 200-inch Hale telescope at Palomar, show that the dwarf has the spectral fingerprint of the planet Jupiter - an abundance of methane. Methane is not seen in ordinary stars, but it is present in Jupiter and other giant gaseous planets in our solar system. The Hubble data obtained and analyzed so far already show the object is far dimmer, cooler (no more than 1,300 degrees Fahrenheit) and less massive than previously reported brown dwarf candidates, which are all near the theoretical limit (eight percent the mass of our Sun) where a star has enough mass to sustain nuclear fusion. Brown dwarfs are a mysterious class of long-sought object that forms the same way stars do, that is, by condensing out of a cloud of hydrogen gas. However, they do not accumulate enough mass to generate the high temperatures needed to sustain nuclear fusion at their core, which is the mechanism that makes stars shine. Instead brown dwarfs shine the same way that gas giant planets like Jupiter radiate energy, that is, through gravitational contraction. In fact, the chemical composition of GL229B's atmosphere looks remarkably like that of Jupiter. The discovery is an important first step in the search for planetary systems beyond the Solar System because it will help astronomers distinguish between massive Jupiter-like planets and brown dwarfs orbiting other stars. Advances in ground- and space-based astronomy are allowing astronomers to further probe the "twilight zone" between larger planets and small stars as they search for substellar objects, and eventually, planetary systems. Caltech astronomers Kulkarni, Tadashi Nakajima, Keith Matthews, and Ben Oppenheimer, and Johns Hopkins scientists Sam Durrance and David Golimowski first discovered the object in October 1994. Follow-up observations a year later were needed to confirm it is actually a companion to Gliese 229. The discovery was made with a 60-inch reflecting telescope at Palomar Observatory in southern California, using an image-sharpening device called the Adaptive Optics Coronagraph, designed and built at the Johns Hopkins University. The same scientists teamed up with Chris Burrows of the Space Telescope Science Institute to use Hubble's Wide Field Planetary Camera-2 for follow-up observations on November 17. Another Hubble observation six months from now will yield an exact distance to GL229B. The astronomers suspect that the brown dwarf developed during the normal star-formation process as one of two members of a binary system. "All our observations are consistent with brown dwarf theory," Durrance said. However, the astronomers say they cannot yet fully rule out the possibility that the object formed out of dust and gas in a circumstellar disk as a "super-planet." Astronomers say the difference between planets and brown dwarfs is based on how they formed. Planets in the Solar System are believed to have formed out of a primeval disk of dust around the newborn Sun because all the planets' orbits are nearly circular and lie almost in the same plane. Brown dwarfs, like full-fledged stars, would have fragmented and gravitationally collapsed out of a large cloud of hydrogen but were not massive enough to sustain fusion reactions at their cores. The orbit of GL229B could eventually provide clues to its origin. If the orbit is nearly circular then it may have formed out of a dust disk, where viscous forces in the dense disk would keep objects at about the same distance from their parent star. If the dwarf formed as a binary companion, its orbit probably would be far more elliptical, as seen on most binary stars. The initial Hubble observations will begin providing valuable data for eventually calculating the brown dwarf's orbit. However, the orbital motion is so slow, it will take many decades of telescopic observations before a true orbit can be calculated. GL229B is at least four billion miles from its companion star, which is roughly the separation between the planet Pluto and our Sun. Astronomers have been trying to detect brown dwarfs for three decades. Their lack of success is partly due to the fact that as brown dwarfs age they become cooler, fainter, and more difficult to see. An important strategy used by the researchers to search for brown dwarfs was to view stars no older than a billion years. Caltech's Nakajima reasoned that, although brown dwarfs of that age would be much fainter than any known star, they would still be bright enough to be spotted. "Another reason brown dwarfs were not detected years ago is that imaging technology really wasn't up to the task," Golimowski said. With the advent of sophisticated light sensors and adaptive optics, astronomers now have the powerful tools they need to resolve smaller and dimmer objects near stars. Hubble was used to look for the presence of other companion objects as bright as the brown dwarf which might be as close to the star as one billion miles. No additional objects were found, though it doesn't rule out the possibility of Jupiter-sized or smaller planets around the star, said the researchers.